On October 8, 2011, I got an opportunity to visit the house in which Madame Curie, one of the greatest scientists of 20th century, was born. The house is in 16 Freta street in the old town of Warsaw, the capital city of Poland. It has been turned to a museum in her name. The museum possesses good collection of letters and photographs which remind us of the life of a great genius in science. I had a great desire to visit the place when I read her biography written by Beverly Birch. Although Curie spent most of her life in France, it was Warsaw where she inherited a desire to devote her life in science. In the museum, we can see her writing desk, inkpot, ruler and even her spectacles case. The physics practical instruments which her father had collected and were very important in stimulating a lifelong interest in science in little Curie’s mind are now preserved in this museum. Another important aspect of the museum is that it also depicts photographs and documents about the life of her Husband Pierre Curie and her daughter Irene curie, who are also great scientists and Nobel laureates. I found that the story of the life and achievement of Madam Curie has inspired thousands of scientists around the world. 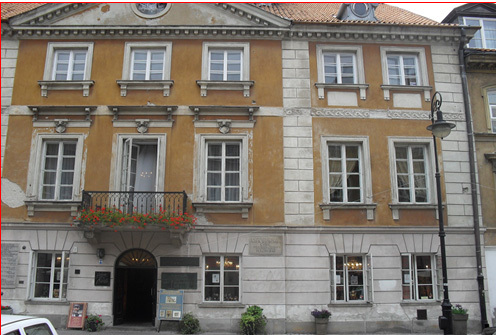 The house in 16 Freta Street in the old Town of Warsaw where Marie Curie was born. The place where the museum is situated is a unique place with exhilarating beauty of nature. Just behind the Freta street there is gentle slope leading to the bank of Vistula river which is flowing majestically dividing the historic Warsaw city. This is a lovely place. Curie was born in this house on November 7, 1867. There is simple plaque beside the door of this house which proudly announces the date of her birth. Her father was a Professor of physics and her mother was a teacher in a school. Marie had a great impression from her father from her early life. She was grown up in an academic environment. Her teachers remembered her as an extraordinary student even at her early years in school. At that time girls were not allowed to enter university and hence she had to go to France for higher studies. She had to work very hard for about seven years in a remote town in Poland to collect money to go abroad for study. Her intense desire to study science was fulfilled when she could get admission in a university in Paris. Curie recalled her happiness of the first day at the university saying that this was one of the happiest days in her life. She proved herself as one of the best students of the university few months after her arrival and after few years as one of the greatest scientists of her time. She became world famous for her discovery of radium with her husband and was awarded the 1903 Nobel prize for Physics. She again received the Nobel prize in Chemistry in 1911. This has been a rare achievement. Madame Curie could have become one of the wealthiest persons in the world because of her discovery of the most precious element radium but she did not use her discovery for her personal benefit. She gave all the radium which she had separated by her four years of hard work with her husband to research laboratories for the benefit of mankind. It is said that when she herself needed some radium later for her own research, she did not have enough money to buy it and had to go to the USA in a fund raising program. It was a great irony. She was not only a great scientist but also a very kind-hearted person. During the First World War, she along with her daughter served as a volunteer health worker with hundreds of mobile X-ray units built by herself. It is believed that thousands of wounded soldiers in the battlefield had undergone X-ray in her machine and were treated by Curie herself. It is surprising to know that she was working in the battlefield in addition to her regular lectures in the university. I regard the place where Marie Curie was born as one of the holy places for those who love science and want to devote their life in the service of humankind. One of the places i hope to visit.